Today, I want to present the Y-chromosome haplogroups of Kurds. The chart below needs to taken with a grain of salt because not all areas of Kurdistan are equally covered, because some publications might have some errors (e.g. Stenersen et al., 2004, Nasidze et al., 2005), and because older publication did not test for all critical SNPs to determine all major haplogroups. 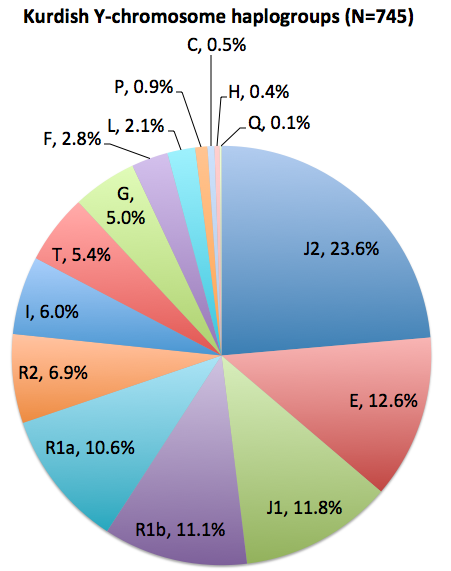 Nevertheless, I think it is fair to say that the main Y-chromosome haplogroups in Kurds are J, R, and E (total 76.6%). I am curious as to why you say that the studies by Stenersen et al., 2004, and Nasidze et al., 2005 may have some errors? Sternersen et al., 2004 just provided STR data for 10 STRs (DYS19, DYS385a, DYS385b, DYS388, DYS389I, DYS389II, DYS390, DYS391, DYS392 and DYS393). I determined the haplogroups based on an online tool (http://www.hprg.com/hapest5/hapest5a/hapest5.htm) that could be off in some cases. Nasidze et al., 2005 observed very high frequencies of haplogroup I for Zaza (33%) and Kurmanjis (16%). These frequencies were never seen before or after the paper in the Middle East. The only scientist that saw high frequencies of haplogroup I in the Middle East was Nasidze (, e.g. for Iranians (34%) in Nasidze et al., 2008). Is the Gokcumen et al., 2011 study correct and accurate do you know? I have no reason to think that the Gokcumen et al., 2011 study is not correct. Since it is based on a single village it is probably better to look at the SNPs and STRs and less at the frequencies. I'm interested in Kurds Y-DNA, is there a way to contact you ? Okay thank you. Do you know if any of these Kurdish men with Y-DNA results above here come from certain tribes or have their direct paternal line roots among any Kurdish tribes?